SimCityEDU isn't about rote learning; it's about application of skill. "We have all these high-stakes assessments focusing the majority of their testing on rote learning and not application of skill," says Glasslab's Seth Corrigan. "We're never going to transform education and prepare kids for success if we don't transform assessment to look at higher-order skills." Glasslab feels games are the best way to do that, and so has picked on SimCity and given it the EDU treatment. Its simulation of energy use, pollution and zoning are, Glasslab believes, the best way to teach students how to think with systems. Balancing all the variables to determine how best to achieve a desired outcome is a very valuable skill, but multiple choice tests don't really get to the heart of the problem. Multiple choice demonstrates how well a fact has been learnt, not how successfully knowledge can be applied. "Zeros and ones," Corrigan says. "That's all the information you've got to work with after the student leaves the room." That's why Glasslab, in cooperation with Electronic Arts, put together SimCityEDU: Pollution Challenge! With it, the game can demonstrate not just what conclusion a participant reaches, but how those conclusions were made. How much time was spent accessing relevant in-game information? Were there any tests done before the participant took drastic action? There's a process behind every major gameplay event, and the whole point behind this experiment is to demonstrate that process at work. 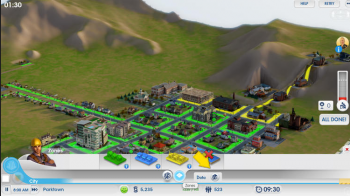 It's not as complex as SimCity itself, but then complexity isn't the point; gathering analytic data, while at the same time avoiding the pitfalls of educational game making, is the goal here. "You have to strike a really careful balance to make the games feel fun and the accomplishments feel satisfying," says EA's senior creative director Michael John. It took Glasslab and its partners $10.3 million and nine months to get to this point. SimCityEDU has battled through its testing and is out in the wild. It's part of a non-profit collaboration, and will distribute its title through many different vendors, including EA's Origin.